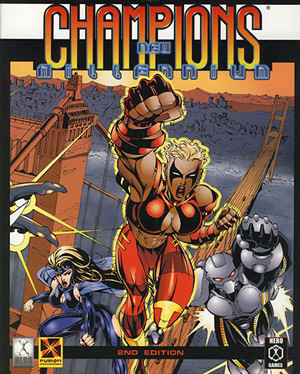 These are brief, rough Fuzion RPG (such as Champions: the New Millennium) to DC Heroes RPG ballparks. If you have no idea what we’re talking about, you can check the Wikipedia entry for Fuzion . 11 + is early Nightwing level (way beyond a normal realistic person). MEGS’ DEX: (Fuzion’s Reflexes + Dexterity + Technique + Hand-to-Hand + Evade)/5, rounded up. Alternatively, if the character uses the Martial Arts plug-in, simply use (Fuzion’s Reflexes + Dexterity)/2, rounded up, for MEGS’ DEX, and give him the full Martial Artist Skill (Linked). MEGS’ STR: (Fuzion’s Strength/2) + 1, rounded up. MEGS’ BODY: (Fuzion’s Constitution + Body)/4 + 1, rounded up. MEGS’ INT: Fuzion’s Intelligence. If Fuzion’s Intelligence is 7 or higher, increase MEGS’ INT by 1 AP; if it’s 10 or higher, increase by 2 APs. MEGS’ WILL, MIND and SPIRIT: Fuzion’s Willpower. If Fuzion’s Willpower is 7 or higher, increase MEGS’ WILL, MIND and SPIRIT by 1 AP; if it’s 10 or higher, increase by 2 APs. MEGS’ INFL and AURA: Fuzion’s Presence. If Fuzion’s Presence is 7 or higher, increase MEGS’ INFL and AURA by 1 AP; if it’s 10 or higher, increase by 2 APs. If the Fuzion character has no Presence-based Skills for direct interaction (like Leadership or Persuasion), or only has a few of them at low values, reduce INFL and AURA by 1 or 2 APs. MEGS’ Running Power (only if Fuzion’s Move is higher than 10): (Fuzion’s Move/2) – 1, rounded up. Most Fuzion Skills can be converted to MEGS Subskills, or possibly the Scholar Advantage. In general, I’d say the easiest way to convert skill values would be to just Link, Half Link or Double Link all of them, as appropriate. Powers have equivalents in both system. In general, every 1d6 of effect (or 5 points of Defense) converts to 1 AP in MEGS. Alternatively, just Link, Half Link or Double Link the whole lot. Just be careful with not going overboard with RV in MEGS.